NFI Code Enforcer - Property Management Application is an integrated code enforcement, permitting and certificate issuing application. The software is an excellent tool for city governments, county governments, state governments or other governments. It can also be used by Housing Complexes, Apartment Complexes and Condo Associations. It gives you the information you need when you need it with the greatest ease of access. Allows cities and counties to enforce codes effectively as well as track Warning Letters, Follow Ups and other information to ensure increased accuracy. Works great for Property Management Software and Mobile Home Park Software too. Speedy data entry using integrated Address Lookup tables from Utility Files (.xls or other format) (some additional costs may be incurred to add your Utility or other similar address table to the application). Speedy data entry enhanced through intuitive drop boxes which auto-fill data for you. The application has been designed with keeping clicks to a minimum. A constant navigation menu allows the User to go from any location in the application to any other location in one click. On screen information and control tips to make the User experience easy. Training is inexpensive with purchase of application. Customization possible to add any additional functionality you may need. Interface is very easy and simple to use. Our Code Enforcement software was designed and developed in Atlanta, Georgia.We can serve you easily and rapidly here or across the country. All maintenance and support done from New Frontiers International's office. Real time access to view information, reports and more. Track information by Ward or other geographic local. Easy ascending or descending sorts on most data. Easy filtering or searching on most data. Data sheet interface for violation data allows hiding/showing columns, rearranging the order of columns, freezing columns, resizing columns, resizing row heights, etc. Summary reports for City Council and Mayor or other Government officials. SQL Server, Access, Oracle or any ODBC compliant software can be used as the back-end database. Warning Letter sent dates automatically updated (though you can override too) after you print them. Warning Letters automatically display ordinance violation, violation date, marshal's name, etc. There is no mail merge required. You are in control: set up your own Marshals, own Ordinances, and your own Status Codes. The information can also be easily copied and pasted from Excel so you don't have to re-key data. We can customize this with the name of your government/company and your logo. Suitable for one to many Users. Can Export or Import data by copying and pasting to and from Excel. 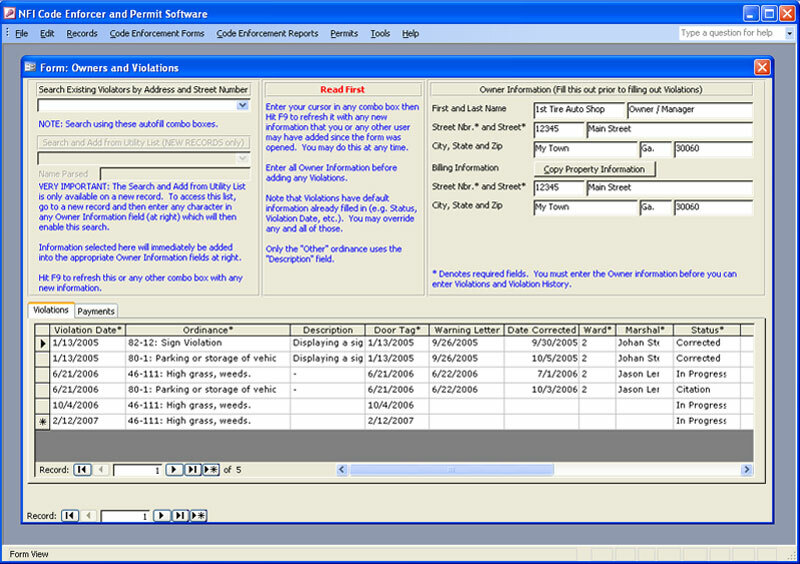 View violator and violations seeing all violations at a given address for a given occupant. Can be enhanced to track any permits or certificates you issue. Let NFI migrate data from older applications into NFI Code Enforcer. Most other customization can be done easily by NFI within the framework we have already built. We provide quick turn around and reasonable prices on any new reports or other enhancements you might need.